Nothing stresses the importance of taking good care of your teeth than the excruciating pain typical of a decayed tooth. This acute pain makes even the wisest and most accomplished people wish they had embraced better dental care habits early in life. The good news is; a majority of dental conditions can be managed, easily at home. You only need to develop a good care routine and stick to it. It's a gradual process; and before you know it, you’ll be a proud owner of a flawless set of teeth so you can wow everyone with your smile. Here are some worthwhile tips to get you started. You’ll be surprised to discover quite a number of things you’ve been doing wrong all along. How often do you replace your toothbrush? Well, as it turns out, 75% of us don’t bother to take the all-important precaution of getting this handy tool replaced every 3 months as doctors recommend. But why do I need to get it replaced all the time anyway? You might want to ask. Well, the answer is simple – over time, millions of bacteria find their way into the bristles of your toothbrush and start multiplying like crazy. So, the longer you keep using your toothbrush, the higher the likelihood of contracting an infection. But even if you’re lucky and nothing of that sort happens, you’ll notice that old toothbrushes tend to get splayed or frayed over time – something that makes them highly ineffective at cleaning your teeth. So, don’t gamble with your dental health. That routine toothbrush replacement is a small price to pay for dozens of health benefits. If you’re like most people, chances are that you wake up seeking to leave your house as quickly as possible. That’s perfectly normal because – hey, we’ve all got meetings to attend and bills to pay. However, without knowing it, most of us usually end up brushing for fewer minutes than what’s recommended. Whether you’re using activated charcoal or the usual fluorine toothpaste brands, it’s important to give the active compound in your paste enough time to take full effect. You may, therefore, want to avoid those 1-minute quick brushing sessions as they do little to help you keep your dental health intact. Instead, you should start doing a minimum of 2 minutes or even up to 3 minutes if you have a minute to spare. You may already be familiar with the recommendation that you should eat less sugary stuff. Maybe you’ve even heard that smoking can also affect your dental health. With all these facts in mind, what’s the last time you ever re-examined your eating habits to spot some of the little-known foods that contribute to browning or decaying of teeth? A simple sip of soda, for instance, ends up coating your enamel layer with loads of sugar – effectively providing bacteria with a leeway to produce acid. If left unchecked, this acid can corrode your teeth and leave you with unsightly cavities and plagues. The same case applies to coffee, potato chip, citrus fruits, and alcohol. Don’t get me wrong, though. I am not telling you to ditch your favorite pick-me-up beverage – coffee. Just stick to taking this kind of stuff in moderation. This rule applies to all – whether young or old. The teeth are specifically meant for eating – and of course, smiling. That said; don’t make the mistake of using them to handle complicated tasks such as ripping packages open, removing bottle tops, cracking nuts and so forth. Well, this one should be obvious yet most of us often find ourselves repeating the same mistakes. You know, the harder you chew on metallic objects, for instance, the weaker your enamel becomes. This leaves your teeth susceptible to cavities. Above all, using your mouth in lieu of pliers, scissors or bottle opener ultimately causes root and gum weaknesses. So, ladies and gentlemen, boys and girls, let’s face the fact that our teeth are not tools! Don’t treat them like it. Much as you'd like to keep your mouth free from any harmful bacteria or food remains, you should never brush more than twice a day. Doing so weakens your enamel – especially if you have the habit of brushing less than 30 minutes after having a meal. The mouth tends to get acidic during and immediately after mealtime. Therefore, roughing up the enamel with a toothbrush only leaves it susceptible to corrosion. Consider swishing some water instead of brushing every now and then. We all know that it’s important to floss, however; the mere fact that this habit doesn’t yield instant gratification makes it a little difficult to keep up with. Unlike brushing your teeth that instantly gets your mouth to smell nice and clean, flossing doesn’t seem to yield any major benefits. But dentists have some pretty good reasons why you should take flossing seriously. This simple routine can help you get rid of any sticky bacteria or plaque before it causes permanent damage. What you always need to keep in mind is that each tooth has 5 different surfaces. Brushing your teeth takes care of only 3 of these surfaces. So what happens to the other 2? Your guess is as good as mine. By flossing, you effectively take care of the 2 remaining surfaces – particularly the surface between the teeth. No amount of scientific data or expert recommendations can make little kids understand the importance of brushing. So, if you’ve been struggling to get your young ones to inculcate this crucial habit, you’d definitely need to make the process look fun and rewarding. Start off by getting them a brightly colored toothbrush – preferably one with their favorite cartoon character design on it. Don’t play hardball! Consider expanding the arena so they naturally can grow into the habit of brushing their teeth. Instead of just brushing in the bathroom, encourage them to brush on the dining table, in the car or even when watching their favorite cartoon. All you want to do is help them associate brushing with good life experiences. You need to keep your mouth moist in order to combat gum disease, cavities and tooth decay. Water not only helps clean out left-over food particles but also stimulates saliva production. One of the primary roles of saliva is to moisten and cleanse your mouth, thereby keeping the conditions in there perfect. The problem with most of us nowadays is that we don’t take enough water. If you’re like most busy people, chances are that the only fluid you take is coffee or soda. However, these kinds of beverages don’t have similar effects to those of pure water. Soda, as we’ve already seen, tends to raise the levels of acidity in the mouth. Coffee on its part is quite brutal when it comes to staining the teeth and providing bad bacteria with the sugar they need to create enamel-damaging acid. So, if you’ve not been doing it already, be sure to start taking pure water in adequate quantities. In fact, you don’t have to stick to the recommended 8 glasses per day. Start out with a glass or two per day, and when this habit becomes part and parcel of your life, you’ll naturally find it easier to achieve the daily recommended water intake. Cinnamon is a naturally occurring tree bark extract or stick which has been used to improve the quality of life for many centuries. As far as dental health is concerned, chewing on Cinnamon sticks can help combat bacteria build up and also get rid of a foul smell in the mouth. So, instead of brushing your teeth in the course of the day just to keep it fresh, it would be a good idea to chew on cinnamon instead. While at it, you should be careful to only use this spice in moderation. If you’re using cinnamon powder, then a single gram would be enough (per day). If you’re using cinnamon sticks, then two average-sized bites are usually enough to get the job done. In the long haul, cinnamon helps lower the levels of Streptococcus mutans, a group of bacteria responsible for dental plaque formation. Citrus fruits are highly acidic and it might not make much sense to add them to your diet because, as we’ve already mentioned, high acidity is a no-no as far as dental health goes. But there’s something unique about citrus fruits – which is why you should add them to your diet no matter what – their acidity content is just enough to ward off gingivitis and periodontal disease. In fact, regular consumption of oranges, lemons, grapefruit etc. can help strengthen your gums. The only thing to take note of is that these too much citrus acid can erode your enamel. So, be sure to buffer these fruits by taking them alongside your meal. This way, you’ll be able to manage their acid content whilst still reaping their numerous health benefits. You may be doing everything right only to realize that your teeth keep turning yellowish or brownish. Well, this happens due to habits such as drinking coffee, smoking or even eating certain types of food. The truth of the matter is that we’re all susceptible to this. Unfortunately, most people make the mistake of going for quick-fix solutions which end up damaging the enamel. You see, the enamel is the hardy cover that protects the inner, delicate surfaces of your teeth. So, the moment you compromise on it, you effectively gamble with the long-term condition of your dental health. The best and probably, most effective way to whiten your teeth, naturally and safely is through the use of activated charcoal. Also known as activated carbon, this is not the kind of stuff you find on your grill. Activated charcoal is usually obtained from particular trees and then “activated” in a manner that enhances its absorptive properties. Modern-day dental health products are increasingly making use of activated charcoal instead of fluoride. As you might be aware, health experts have raised a red flag against the continued use and ingestion of fluoride since it can lead to long-term health effects. But What Is It Like To Use Activated Charcoal? On the flipside, though, the use of activated charcoal tends to be a little messy. The mixture can easily spill over from your mouth if you’re not paying attention. On top of that, because this is charcoal, your mouth ends up looking pitch black – until you rinse it. But given the many benefits you stand to reap from this natural product, those few inconveniences are a small price to pay – really. 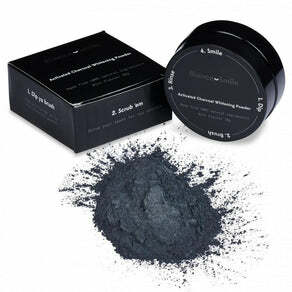 A good example of a healthy and highly effective activated charcoal product is the Bianco Activated Charcoal Whitening Powder. Known for making teeth look up to 14 shades whiter, this relatively popular product claims to offer guaranteed, teeth whitening benefits using a 100% natural and chemical-free approach. Apart from helping remove plaque, activated charcoal comes in handy in eliminating bad breath, clearing bad bacteria and above all leaving your teeth and gums healthier. So, whether you want to get rid of a foul smell or simply whiten your teeth, the key thing to do is embrace healthy lifestyle choices. Watch what you eat, floss your teeth regularly, drink lots of water and above all, don’t hesitate to give activated charcoal among other natural dental care products a try. Once all that is done, you can go ahead and wear a bold smile knowing that your oral hygiene is well taken care of. SMILE and don't forget to Share this Easy Care Tips, too!